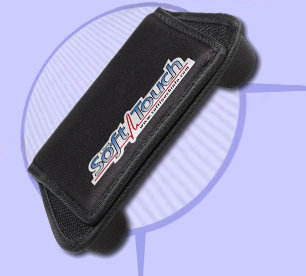 SoftTouch: Advanced seatbelt protection for defibrillator, pacemaker, chemotherapy port, and other medical implant patients. 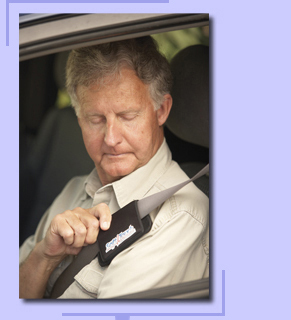 The patented SoftTouch seat belt pad is designed to provide comfort and a level of protection to patients with implanted devices or other medical conditions while wearing a seat belt. Made with polyurethane and silicone gel and extensively tested at the Transportation Research Center, the unique design and construction of the SoftTouch pad enables the implanted medical device to sit in a free air space, reducing the forces over the region where the device is positioned, and better protecting the driver in the event of an automobile accident. Discomfort can also occur due to seat belt vibration over the pacemaker implant area. SoftTouch lifts the shoulder belt, like a bridge, over the area of concern, eliminating direct contact between the medical device and shoulder belt while lessening vibration transmission. Click here to learn more about SoftTouch. For women, irritation of the implantation site can also be a problem when wearing a bra. That's why we developed the comfortHer bra strap pad.